There comes a time in every forward-thinking musician’s journey when it seems the possibilities of traditional instruments have been exhausted, every string already plucked, every chord already strummed. Computers and samplers are one contemporary solution to composer’s block, but they don’t provide quite the same satisfaction as being able to hit, blow or caress a physical object in order to create a pleasing noise. For some, the only solution has been to invent their own instrument. Here are eight examples of when musicians ditched the guitar, bass and drums for something more outlandish of their own creation. Most of these bespoke instruments led to some pretty interesting music… even if you’re unlikely to see any of them being played at your local open-mic night any time soon. Icelandic innovator Björk has a history of using strange or bespoke instruments and incorporating them into her digital world. Having used a celeste - a kind of small, spectral piano - to great effect on 2001’s Vespertine, Björk decided that for her multimedia Biophilia project, she wanted to cross-breed it with Balinese gamelan tonebars, adding remote control for good measure. British percussionist Matt Nolan and Icelandic organ craftsman Björgvin Tómasson were commissioned to build the hybrid instrument, which they managed to do in a very intense week-and-a-half. You can hear the bewitching results on the track Crystalline, below. The gameleste isn’t the only instrument Björk invented for her Biophilia tour; she also created a visual synthesiser, a pendulum harp and a crystal trombone. In the days before sampling, 10cc’s quest to cheaply reproduce the sound of an orchestral string section led them to invent the Gizmotron - a device that clamped across the strings of an electric guitar, its small motor-driven plastic wheels providing a hypnotic sustain effect. 10cc used the Gizmotron widely on 1974’s Sheet Music and its two subsequent albums. Drunk on possibility, Kevin Godley and Lol Creme then quit the band to develop the instrument, showcasing its charms on their 1977 triple album Consequences. Mass production commenced, yet despite further exposure on albums by Wings and Led Zeppelin, the Gizmotron proved unreliable and ended up bankrupting its manufacturer, Musitronics. Luckily, there’s a happy ending - in 2013, a new team of engineers took up the concept and you can now buy your very own Gizmotron 2.0 for $289.99. This incredible mutant guitar looks like a photoshop creation but we can assure you that jazz virtuoso Pat Metheny has been witnessed playing the Pikasso at many of his concerts since the mid-80s. The four-necked, 42-stringed beast was invented by Metheny in conjunction with Canadian luthier Linda Manzer and was named the Pikasso because, well, you can see why. It took two years to build and includes a 'hexaphonic pickup', allowing Metheny to trigger samples as he plays. More recently, Metheny has unveiled his Orchestrion - a whole ensemble of custom-built, self-playing instruments that serve as his backing band. Which is one way to get the tour bus to yourself. Japanese avant-rock band Boredoms see Pat Metheny’s four-necked guitar and raise him… a seven-necked guitar! Admittedly, theirs is a rather blunter instrument than Metheny’s; rather than pluck it mellifluously, Boredoms leader Yamantaka Eye prefers to mount his tree-like creation on top of an amplifier and attack it with drumsticks. 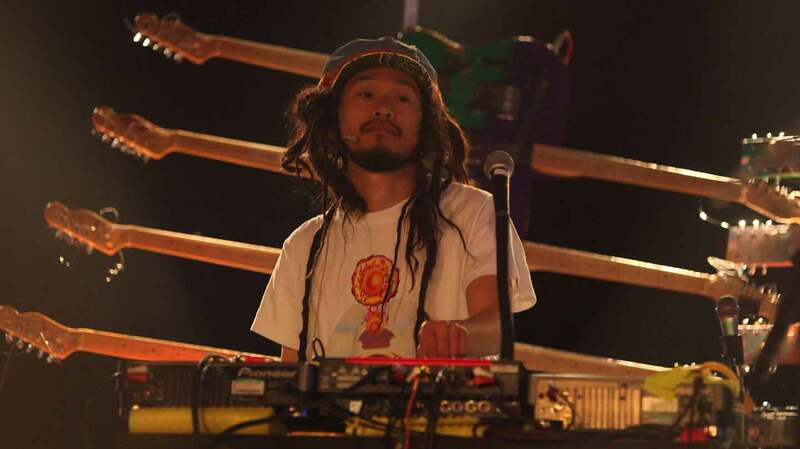 It’s all part of Boredoms’ mission to expand the possibilities of regular instrumentation. One of their other great musical experiments includes staging a concert with a 77-person drum circle. Synthesisers have long been part of pop’s everyday language but back in the 1970s they were still a strange and novel invention; the sight of electronic music trailblazers Kraftwerk abandoning traditional instruments to play everything on little black boxes was truly revolutionary. Yet Kraftwerk still wanted to retain an element of theatre to their live performances, hence their invention in 1974 of the laser drum cage - a tall rectangular structure that the band’s Wolfgang Flür would stand inside to trigger drum sounds by breaking laser beams with his hands. Unsurprisingly, according to Flür, the laser cage was unwieldy and would regularly break down. Hence why, in the clip above, from a 1975 edition of BBC’s Tomorrow’s World, they appear to have abandoned it in favour of whackable electronic drum pads. Yet the concept of the laser cage lived on in the form of the laser harp, which became a staple of Jean Michel Jarre’s live shows from 1981 onwards. 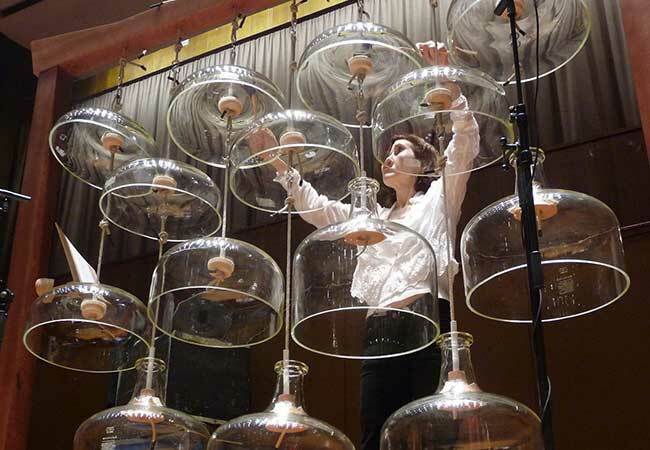 Harry Partch - Cloud-Chamber Bowls, Harmonic Canon, Quadrangularis Reversum, etc. American ‘outsider musician’ Harry Partch - a big hero of Iggy Pop and Tom Waits - was renowned for building his own instruments in order to play his idiosyncratic, microtonal, other-worldly compositions. These beautiful one-of-a-kind instruments were often built using scavenged materials (the Zymo-Xyl, his take on the xylophone, includes ketchup and wine bottles and a couple of hubcaps) and given evocative names such as the Harmonic Canon (a type of plucked box zither) or the Quadrangularis Reversum (a complex, custom-built marimba). As detailed on the University of Washington's site, Paul Simon used a number of original Harry Partch instruments, now housed at the university, on his 2016 album Stranger to Stranger. 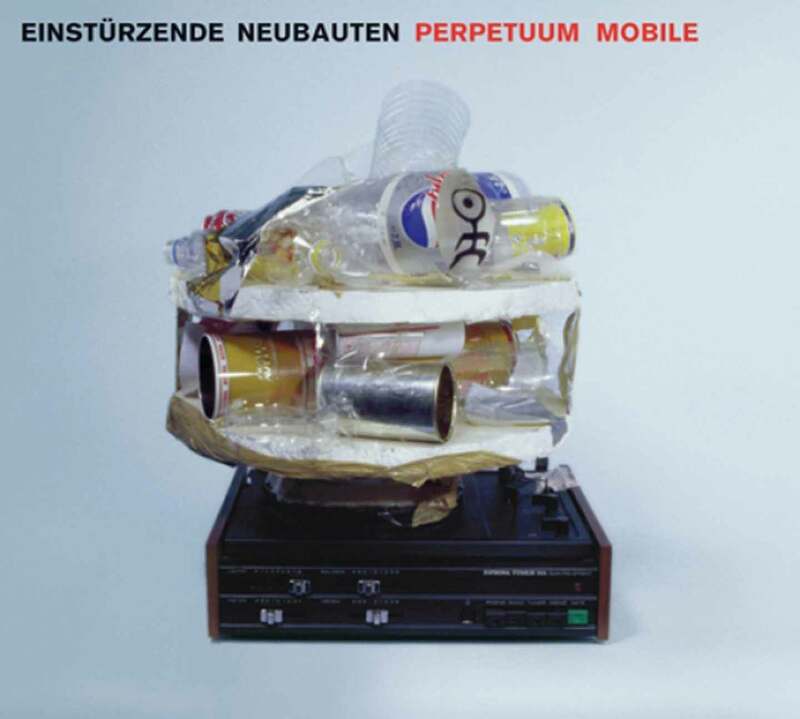 German industrial stalwarts Einstürzende Neubauten are famous for their use of “non-instruments”, utilising chains, power tools and sheets of scrap metal in order to create their harsh, metallic sound. An infamous 1984 performance at London’s ICA involved pneumatic drills, chainsaws and a cement mixer that sprayed glass fragments into the crowd. By 2004’s Perpetuum Mobile they’d calmed down a little, utilising plastic tubes, electric fans, gas burners, polystyrene flakes, dried leaves and a Heath-Robinson device they dubbed the ‘air cake’. As the band explained to Sound on Sound, it consisted of a series of tin cans and plastic bottles gaffer-taped to a record turntable. As the air cake spun, the band would ‘attack’ it with blow guns of the type used to inflate car tyres, providing all kinds of unexpected pitches and resonances, in the manner of a deconstructed pipe organ. With the bonus that it didn't scar the faces of anyone watching.